26.02.2006 at 0530 UTC in position 02:13N - 045:55E, off Mogadishu, Somalia. Pirates armed with guns in two speedboats boarded a wooden dhow underway. They hijacked the dhow and are holding the 25 crew hostage. In the latest grim episode of asylum seekers and migrants dying while trying to cross the Gulf of Aden from Somalia to Yemen, the United Nations refugee agency reported today that smugglers forced 137 men, women and children into deep waters off the Yemeni coast, killing at least 33, with another 30 missing. "The latest tragic incident once again highlights the urgent need for joint international and local efforts to address this problem and minimize the flow of desperate people who fall victim to ruthless smugglers," UN High Commissioner for Refugees (UNHCR) spokesperson Jennifer Pagonis told a news briefing in Geneva. Thousands of Somalis, many fleeing violence in their homeland, arrive in Yemen every year, averaging an estimated 100 people a day during the annual September to March period of good sailing conditions, after making the perilous crossing in the hands of smugglers who often beat them or force them overboard while still far from shore, sometimes with their hands tied behind their backs, leaving them to the mercy of the seas. This sort of thing has been going on a long time in a variety of areas (including the US Southwest deserts) as people in one God-forsaken place make every effort to get out --even with improbably high odds against success. The smugglers, if caught, should "enjoy" the same treatment as their victims. Reports of baboons and hyenas attacking communities in drought-stricken Somalia are becoming common. The wild creatures are said to be locked in competition with human beings in search of water as the merciless drought currently affecting the entire Horn of Africa region exhausts both food and water supplies. In Tayeglow district in Bakol region, southern Somalia, a vicious attack by baboons led to the deaths of several animals and injury to some pastoralists when a war for water broke out. Ravenous hyenas, capable of breaking a camel's neck with one snap of their strong jaws, often attack in broad daylight. It is a fight for survival as drought takes its toll on communities in various regions, especially in southern and central Somalia. Desperation is even reported from riverine areas. Lorry drivers and conductors have begun complaining of herds of monkeys positioning themselves at strategic road intersections or on bridges to raid lorries with loads of fruits destined for markets in Mogadishu. The sight of animals making off with bunches of bananas or 10kg watermelons is common, to the annoyance of horticultural traders whose profits are dwindling due to scarcity of commodities. "The road section between Shalambood and Afgoye towns in Lower Shabelle region, south of Mogadishu, is the worst," complained Ali Hashi Damal, a young conductor. In rural areas, carcasses of dead animals are a common sight, while villagers complain of putrefying dead animals causing a health hazard to those who still keep some grains for survival. The scorching sun, a dusty environment and heightened population mobility are already worsening the magnitude of the starvation. ...rious good samaritans have also been trying their best to reach the needy. Their efforts are however hampered by internal hostilities between Somalis. Moreover, food supplies arriving at the harbours have to be transported inland by lorries over potholed and badly damaged roads; the vast country does not even have a railway system. Trucks carrying relief items generally take days, if not weeks, to reach their destinations. The situation is worsened by armed groups along the route who often hold the trucks to ransom. Until recently, the logistical problems were limited to inland areas, but recently sea pirates around Somalia's waters have begun attacking vessels. They don't care if the ships contain commercial goods or relief items. Once they get hold of the crew, they demand a ransom. - The forecast for the ‘gu’ rains is not promising (March – May). The number of food aid beneficiaries could increase significantly if the rains are poor. - Water shortage reaching critical levels with 640,000 people requiring emergency water in Somali Region and 100,000 in Borena. ...The Disaster Preparedness and Prevention Agency (DPPA) continues to dispatch emergency food aid for 1.5 million people in Somali Region and for 155,000 beneficiaries in Borena zone of Oromiya Region. WFP is providing a full food basket and supplementary food for 35 percent of beneficiaries regarded as the most vulnerable groups. The DPPA has sent a multi-sectoral assessment team (MoWR, MoH, MoARD) to Jijiga, Liben, Afer and Gode in Somali Region to jointly monitor the situation. However, the humanitarian crisis in Borena zone has not yet adequately captured the attention of humanitarian partners at all levels. This is mainly due to poor capacity of the zone to manage the crisis, including prioritising the needs and sharing information timely. There is a strong fear that massive death of animals could occur in the coming few weeks. Sectoral taskforces have quantified their respective emergency needs; however, to date, there is no consolidated emergency need. The head of the Nigerian military unit seeking the release of nine kidnapped foreign oil workers says there is no military solution to the crisis. Brigadier Gen Elias Zamani told the BBC that the government hoped mediation efforts would see their release soon. They were seized in the Niger Delta in one of a series of attacks by militants on the oil industry last week. The militants have been demanding a greater share of the region's oil wealth for local Ijaw people. On Monday, the federal government gave the TTA proposal a low rating and announced that no money for the Triangle Rail is in the president's budget. Despite the news from Washington, D.C., the local commuter effort will continue because of the need. The TTA says federal funding is not the only means in which the rail system could be built. Ronald Reagan used to say the closest thing to eternal life on earth was a government program. I’m beginning to think the Triangle Transit Authority is may prove his point. Did that please the TTA? Not one bit. It rolled-out old warhorse (and now TTA’s legal counsel) Wib Gulley for a late-night news conference to respond. Gulley said: Not so. According to Gulley the TTA has discovered it left 132,000 commuters out of it’s computer model – and the new model will give a better chance of getting its hands on federal money. The problem is we’ve heard that before. It’s almost become TTA’s standard response to a no – we have to redo the computer model. The TTA has been going on for ten years and its proposal has grown from $100 to $800 million. It is a bureaucracy fighting for the government equivalent of eternal life – so that whatever happens it can keep on keeping on at taxpayers’ expense. And it’s got politicians like Raleigh Major Charles Meeker – who is apparently heart-set on light-rail whether it’s needed, justified, and no matter what it costs – helping them. These folks have been burning through taxpayers’ money for ten years and it’s time they stopped. Senator Dole and Senator Burr gave the TTA some good advice: Move on. When the federal government – which normally has never seen a pork-barrel project it doesn’t like – says your project is a waste of money, it’s time to give up. To date, the Triangle Transit Authority has spent more than $140 million on the Triangle Regional Rail Transit System, which would provide a commuter rail line between Raleigh and Durham. But with funding resistance from the federal government, Raleigh City Council Member Philip Isley wants the city's share of the money back. "I don't think anybody who has looked at this objectively would disagree the federal government has done pretty much everything possible to make sure this does not occur," Isley said. "We've got a pot of money out there that's not being utilized. My hope would be that we could take a look at it." About $7 million a year from a rental car tax goes toward the Regional Rail project. Isley wants the City Council to lobby the Legislature to let Raleigh and Wake County use the tax money for road and school needs. The TTA will know by Sept. 30 if the project is permanently derailed from federal support. Even if it's not, Worthy says the project could continue with local funding.
. Simon says the Chinese judiciary is trying to get control of the process. 1. Ro Ro ship underway reported being followed 18 Feb, Somalia. platform, threatening a more brutal attack (LM). In other words, not only is the New York Times, by publishing this photograph -- publishing it in quite large size in the paper edition, by the way -- giving the terrorists the opportunity to give emotional punch and credibility to their threats that they would not otherwise have, the Times' representative is apparently the one who staged the text they are using to begin with. This is not a photograph of a historic event or a text that teaches us about the group because they provided it. This is a staged photograph of a group of people, but the terrorists are staged in such a way as to showcase the fact that they pose a threat to their hostage. Thus the Times creates for them the chance to publicize their threat, a chance they would not otherwise have, and a critical chance. I was originally going to criticize the Times for making the decision to publish the photograph, which gives their threat legitimacy, but in fact the Times complicity here goes far deeper. 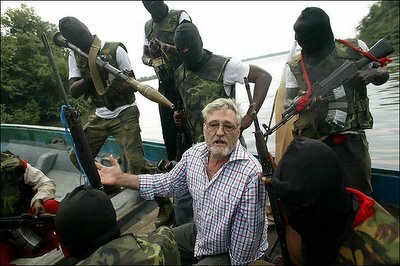 Macon Hawkins of Kosciusko, Tex., an employee of a pipe-laying company, is a hostage of the Movement for the Emancipation of the Niger Delta. Large portions of the Nigerian population may, in fact, have legitimate complaints over the manner in which the oil and gas wealth their country is being exploited, stolen, sold and much more. But this sort of coverage of a staged event* provides proof to would-be terrorists that outrageous acts can provide a forum for their complaints. Next time, when a NY Times reporter is grabbed and weapons pointed, I wonder if the Times will be so thoughtless. Meanwhile, I suggest some prayers for Mr. Hawkins, who is apparently to the NY Times just grist for their mill. *How do we know it's staged? Among other reasons, only an idiot (the masked man on the left) would point an RPG at a hostage in real life- especially at such close range. Gunmen on Sunday hijacked an Indian dhow with 25 crew in the high seas off Somalia's pirate-infested coastline, a maritime official said. "We do not know the exact location, but we suspect it was in northeastern Somalia," said Andrew Mwangura of the seafarers' assistance programme in the Kenyan port town of Mombasa. Mwangura said the dhow, MV Bhakti Sagaar, was seized as it was sailing from the southern Somali port of Kismayo to the port of Elmaan, north of the capital Mogadishu. "It was empty when it was seized but we have managed to contact the US navy in the Horn of Africa," Mwangura said, adding that he was also in touch with Indian maritime officials to get more information. Hmmm. "...we have managed to contact the US Navy..." We may need to set up a 911 emergency line. 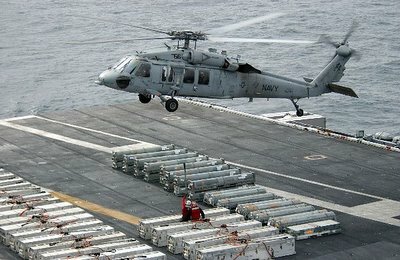 With President Bush about to visit India, India and the US are cooperating militarily more than ever as reported here. The United States on Monday pledged to help combat the threat of piracy and terrorism in the Straits of Malacca, one of the world's busiest shipping lanes. Details of the cooperation will be planned after Malaysia, Indonesia and Singapore sign a pact in April outlining standard operating procedures for maritime security, said Adm. William Fallon, commander of the U.S. Pacific Command, which includesU.S. forces in the Indian Ocean and the Pacific. "We are standing by to help. We are hopeful that when this agreement is formalized then we will have a better understanding of what we might do," Fallon, who is based in Hawaii, told a news conference. Fallon, who is visiting the region, did not give details of the assistance that the U.S. wants to give to protect the waterway that is used annually by about 50,000 ships, carrying half the world's oil and a third of its commerce. But regional officials have said that help would be sought from the United States, China, Japan and other powers to contribute equipment and expertise aimed at strengthening air patrols launched in September by Malaysia, Indonesia and Singapore, the three countries that border the sea route. Theyalso conduct coordinated sea patrols. The help is likely to be limited to capacity building and technical cooperation, without any foreign military presence in the strait. Malaysia and Indonesia have ruled out any direct foreign intervention, saying other countries must respect their territorial sovereignty. The Counterterrorism Blog reminds us of The 13th Anniversary of the 1993 WTC Bombing - NEVER FORGET. The excellent Korea Liberator blog points to more nonsense from our North Korean Windbags of Death. 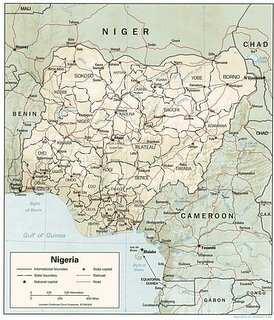 Vessel Tracking System for Nigerian waters? Speaking against the backdrop of the porous nature of the nation's waters, an expert, Mr. Abel Edijala called for the setting up of a Vessel Traffic Management Authority (VETMA). He said vessel traffic management is an act of providing active monitoring and navigational advice for vessels either in particularly confined and busy waterways or the oceans at large. According to him, the two main types of Vessel Traffic Schemes (VTS) are the surveilled and non-surveilled systems. The surveilled system consists of one or more land-based sensors which output their signals to a central location where operators monitor and manage vessel traffic movement. For non-surveilled systems, they consist of one or more reporting points at which ships are required to report their identity, course, speed and other data to the monitoring authority. They encompass a wide range of techniques and capabilities aimed at preventing unauthorized and unnoticed entry of vessels into a country's territorial waters. Mr. Edijala explained that they are also aimed to prevent vessel collision, ramming and groundings in the harbour, harbour approach and inland waterway phase of navigation. He said they are also designed to expedite ship movements, increase transportation system efficiency and improve all weather operating capabilities. The expert stated that in view of the fact that Nigeria's waterways accounts for over 95 per cent of the mainstay of the Nigerian economy in terms of both export and import activities, it is only pertinent that a monitoring and surveillance agency be set up. He highlighted the need for VETMA to include the fact that the surveillance system overlooking Nigeria's oceans/seas will check leakage arising from illegal oil bunkering vessels operating in the nation's waters. Mr. Edijala explained that vessels involved in moonlighting, a term that refers to vessels that ship into Nigeria's export terminals under the cover of night with security agencies looking away will be eradicated as the Automatic Identification System (AIS) is not hindered by visibility. Arms trading for oil which is the major source of gun running in the Niger Delta region, he said shall be cut off through vessel monitoring. "Hostage taking and piracy will be highly reduced as locating vessel position will be easier to track down these unprits", he added. As previously noted losses to the Nigerian economy by fuel thieves run about 30,000 barrels of oil per day. Stopping that leak might pay for an excellent VTS system. Perhaps this outfit could help. And a sample from the US Coast Guard Port of Houston VTS here. 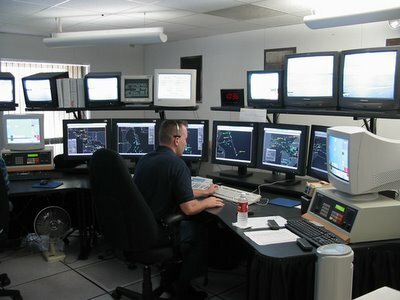 Photo is of a part of the Houston system and the "chart" is a radar image from that system looking at a portion of the ship channel passing through Galveston Bay. A regional maritime coordination centre in Mombasa will be revived to help fight piracy in the Horn of Africa. The centre would initiate and maintain a worldwide navigation warning system for ships off the coast of Somalia, Transport minister Chirau Ali Mwakwere told a meeting of agencies and states affected by piracy. "The system is vital in guiding ships sailing in the high risk areas, to eliminate the likelihood of their falling into the hands of pirates," he said. And the Search and Rescue Centre, which is under construction, would be in operation by May, to help boost the fight against piracy, said the minister. The meeting being held at the Nyali Beach Hotel is expected to form a task force to look into ways of fighting piracy in the region. At the meeting are delegates from the USA, Britain, Kenya, Tanzania, Somalia, Bangladesh, India, the International Maritime Organisation, and the World Food Programme. "These attacks are a threat to the economies of eastern and southern Africa and the landlocked countries in the region," said Mr Mwakwere. Ali informed the police that the four men approached his company's boats in two separate vessels. They took the guards stationed at the tugboats hostage and loaded the stuff into their boats. The names of the tugboats are Jawa and Jawa Bosar. The 'pirates' took away motors, some tools and copper and scrap. The police said that the tugboats were being repaired and had been out of order for the last six months. 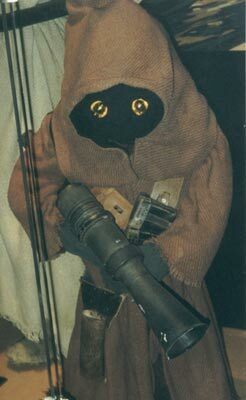 Of course, in the Star Wars movies, the scavengers were the Jawas. A Nigerian court has ordered oil giant Shell's local operation to pay $1.5bn to the Ijaw people of the Delta region. The Ijaw have been fighting since 2000 for compensation for environmental degradation in the oil-rich region. They took the case to court after Shell refused to make the payment ordered by Nigeria's parliament. Ijaw militants have staged a spate of attacks against Shell facilities recently and are holding seven foreign oil workers hostage. Following the violence, Shell - the biggest oil producer in Nigeria - has halved its output from the country. Shell says it believes there is no evidence to support the claim, and will appeal against the ruling. A statement said: "We remain committed to dialogue with the Ijaw people." Saudi security forces have foiled an apparent suicide car bomb attack on a major oil production facility in the eastern town of Abqaiq, reports say. At least two cars carrying explosives were fired on at the plant, Saudi officials have said. BBC security correspondent Frank Gardner says the attack is the first direct assault on Saudi oil production. 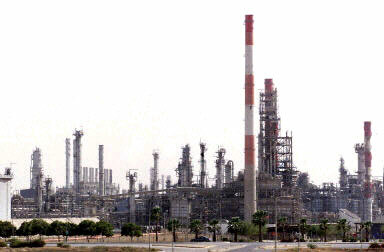 About two-thirds of Saudi Arabia's oil is processed at the Abqaiq plant, one of the largest in the world. Oil security analysts have estimated that a serious attack on the Abqaiq facility could halve Saudi exports for up to a year. Saudi Oil Minister Ali al-Nuaimi said the kingdom's oil output - the largest in the world - was unaffected by the attack, AFP news agency reported. The Saudi oil minister said the blast "did not affect operations" at the Abqayq facility, denying an earlier report on Al-Arabiya television that the flow of oil was halted briefly. The facility "continued to operate normally. Export operations continued in full," the minister, Ali Naimi, said in a statement. Most of Saudi Arabia's crude oil is exported from the Persian Gulf via the huge Abqaiq processing facility, which handles around two-thirds or so of the country's oil output. Saudi Arabia's primary oil export terminals are located at Ras Tanura (6 million bbl/d capacity; the world's largest offshore oil loading facility) and Ras al-Ju'aymah (3 million bbl/d) on the Persian Gulf, plus Yanbu (as high as 5 million bbl/d) on the Red Sea. Combined, these terminals appear capable of handling around 14 million bbl/d, around 3.0-3.5 million bbl/d higher than Saudi crude oil production capacity (10.5-11.0 million bbl/d), and about 4 million bbl/d in excess of Saudi crude oil production during the first half of 2005. Despite this excess capacity, there have been reports that the Saudis are planning to conduct a feasibility study on construction of an oil pipeline from the Empty Quarter of southeastern Saudi Arabia through the Hadramaut in Yemen to the Arabian Sea. I suspect security will be tightened at these export terminals and along pipelines in a hurry. 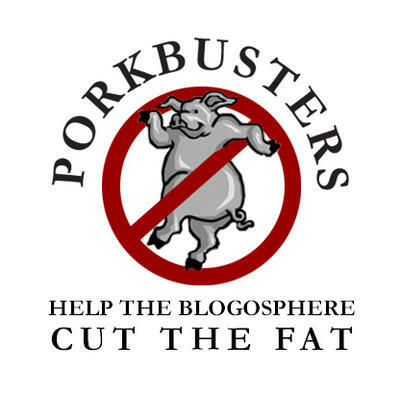 UPDATE: The Counterterrorism Blog coverage here. A USA Today report says that Matthew Simmons, a Houston-based investment banker who specializes in oil and gas ventures, said that he was alarmed by the light security at Saudi Arabia's massive Abqaiq oil processing plant. To cripple the Saudi oil network, "All you'd need to do would be to get a big fire raging at Abqaiq," Simmons says. "It's got a chain-link fence around it. Chain-link fences aren't exactly the Maginot Line." See Chuck Schumer: Terrorists Could Alter Ship 'Manifolds' . Despite his apparent ignorance on the subject of shipping documentation, Schumer took credit for exposing the Dubai ports controversy, insisting: "I was the first one who mentioned it, as you know, a week ago Monday." PIRATES using fleet of nine fast speedboats attempted to board a chemical tanker sailing through the Gulf of Aden in broad daylight last Saturday. According to the latest weekly report from the ICC International Maritime Bureau, six speedboats doing 20 knots surrounded the tanker while it was underway. The master altered course, increased speed, raised the alarm and mustered the crew. Three more speedboats joined the attacking group. The source of the report is the Wekly Piracy Report from ICC Commerical Crime Services (to Feb 20) which is found here. The Government is conducting an investigation into the loss of the explosive consignment meant for use by the Border Roads Organisation (BRO) for its Project in Afghanistan while it was being shipped from Mumbai to Afghanistan between 22nd and 23rd December 2005. Six containers containing explosive cargo for the BRO were swept over board from the deck of the ship MV EUGENIA. From the six containers, four have been extricated and their contents verified and found to be in order. Two containers are yet to be traced and the Navy is of the opinion that they may have merged with the wrecks of 2 ships, lying in the same area or drifted away. The four containers have been shifted to the premises of the manufacturer M/s Premier Explosives for destruction. Ultimately, U.S. ports to a large extent are dependent on security measures in foreign ports, making the issue a global problem, experts say. Mr. Flynn points out that Israel operates one of the most comprehensive security systems in the world, and yet found itself nearly facing catastrophe because it had no control over cargo security procedures at the foreign port where the suicide bombers smuggled themselves into a container. Congress will, I am sure, be able to confuse the issue as the silly political games continue. Just about any given time, it's possible to find a Greek-owned ship flying a Liberian flag, employing a Filipino crew and carrying cargo from China into a U.S. port terminal managed by a British company that hires American longshoremen. This is how Wal-Mart, Best Buy, Target and others get their socks and stereos for the U.S. consumer. So, some in the shipping industry have been taken aback in the past week by growing criticism in Washington and in state capitals to a deal that would transfer control over some operations in several major U.S. ports from a British company to one owned by the government of Dubai. "To be fair, we're on the edge of the world and we haven't done a good job explaining how we work, so people are confused by it," said Art Wong, a spokesman for the port of Long Beach, near Los Angeles. ...In the major U.S. ports where Dubai Ports World would operate terminals - Baltimore, New York, New Jersey, Miami, New Orleans and Philadelphia - many of the shipping lines, the stevedores that load and unload ships and terminal operators have foreign owners. The top 10 containership fleets are based in Denmark, Switzerland, Taiwan, China, Germany, France, Japan, Hong Kong and Singapore, said Peter S. Shaerf, managing director of AMA Capital Partners LLC, a merchant banking firm that focuses on the maritime and transportation industries. All call on U.S. ports, and some of the shipping lines manage terminals. ..."The real risk is in a poorly run port. A badly run port is more of a terrorist target than perceived bad ownership," Shaerf said. "This is an international business. If you welcome their commerce, you have to welcome them." Many U.S. ports, including Baltimore's, have offices and agents overseas to drum up business from foreign companies. Some want shipping lines to visit their terminals, and some want them to run and invest in their operations. Cosco (owned by the Chinese government) was operating at Long Beach when the political questions arose in 2000, Wong said. The company still operates there, bigger than ever because of record imports coming to the West Coast from Asia. Although Cosco was barred from moving to the former Navy location, other companies moved to that site, freeing land around Cosco's operation where it could expand. By its very nature, sea transportation is an international busniness. Spending a couple of days fulfilling my Continuing Legal Education requirements. Which, for the benefit of you non-lawyers, is the opportunity for me to spend a couple of days not doing meaningful legal work in my field of expertise while attending lectures for which I have paid a hefty price. I know, I'll be a better lawyer for it. As you might gather from reading this blog, I am big on protecting the US, but I find the uproar over the issue of a Dubai company taking over six ports to be completely misplaced. We need to get everyone connected to the global economy, not shut them out. The President is exactly right on this one. My personal opinion: If we're going to engage in "business profiling" to prevent companies from Arab companies from buying national security-related assets, we might as well start "personal profiling" to keep Arab terrorists from penetrating our border and transportation security. It doesn't make sense to me to do one and not the other. Uh, wait, my Lenovo Thinkpad is beeping an alarm. More connectedness is better. Foreign companies already own most of the maritime infrastructure that sustains American trade — the ships, the containers, the material-handling equipment, and the facilities being sold to the Dubai company. It's a little late now to start worrying about outsourcing seaborne trade, but congressional hearings could serve to clear the air. Sure security is important. That’s why after 9/11, America led the effort to establish the International Ship and Port Security code that every country that trades with and operates in the United States has to comply with. And compliance isn’t optional—it is checked by the U.S. Coast Guard. And the security screening for the ships, people, and cargo that comes into the United States is not done by the owners of the ships and the ports, but by the Coast Guard and Customs and Border Protection, both parts of the Homeland Security department. Likewise overall security for the port is coordinated by the captain of the port, a Coast Guard officer. What happens when one foreign-owned company sells a U.S. port service to another foreign-owned company. Not much. Virtually all the company employees at the ports are U.S. citizens. The Dubai firm is a holding company that will likely play no role in managing the U.S. facilities. Likewise, the company is owned by the government, a government that is an ally of the United States and recognizes that al Qaeda is as much a threat to them as it is to us. They are spending billions to buy these facilities because they think it’s a crackerjack investment that will keep making money for them long after the oil runs out. The odds that they have any interest in seeing their facilities become a gateway for terrorist into the United States are slim. But in the interest of national security, we will be best served by getting all the facts on the table. 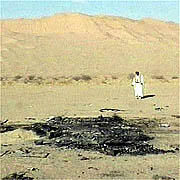 BACKGROUND On 24 April 2004, terrorists conducted suicide attacks against the Al Basra Oil Terminal (ABOT) and a Coalition warship near the Khawr Al'Amaya Oil Terminal (KAAOT). The terrorists used ordinary dhows, fishing boats, and speedboats to conduct the attack. Their unlawful actions are intentionally designed to put innocent persons at risk. 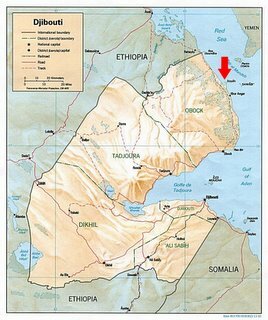 RECENT EVENT On 3 February 2006, a cargo dhow sailed into the KAAOT Exclusion Zone after repeated warnings to change course. Coalition Maritime Forces and KAAOT security forces warned the dhow via bridge-to-bridge VHF radio, ship mounted loudspeakers, the firing of flares and other means. The cargo dhow was repeatedly warned to turn and repeatedly failed to do so. Only after shots were fired, did the dhow finally comply. Thankfully, no lives were lost in this incident. All mariners are reminded to identify themselves and make their intentions known when operating near Coalition warships. If queried, mariners should immediately clearly identify themselves, state their intentions, and if given directions from Coalition warships, they should promptly execute such directions so as to make their intentions known. Mariners are reminded that Coalition warships are prepared to take defensive measures, including if necessary the use of deadly force, against any contact whose identity or intentions are unknown or which poses a threat. Khawr Al'Amaya Oil Terminal (GEOREF 29-46.8n, 048- 48.5e). The warning zone extends 3,000 meters from the outer edge of the terminal structure, in all directions, creating a racetrack shape 6,990 meters long by 6,107 meters wide, oriented northwest to southeast, centered on the terminal. This warning zone is distinct from, and in addition to, the exclusion zone established later in this advisory. Al Basra Oil Terminal was formerly known as the Mina Al Bakr Oil Terminal (GEOREF 29-40.8n, 048-48.5e). This warning zone extends 3,000 meters from the outer edge of the terminal structure, in all directions, creating a racetrack shape 7,030 meters long by 6,107 meters wide, oriented northwest to southeast, centered on the terminal. This warning zone is distinct from, and in addition to, the exclusion zone established later in this advisory. VLCC traffic to the terminals remains at high levels. In addition to berthing and departing VLCCs and assisting tugs, Coalition warships conducting maritime security patrols maneuver unpredictably within the Warning Zone. Vessels are advised to remain clear of the ABOT and KAAOT Warning Zones. Transit should not require entry into the Warning Zones. 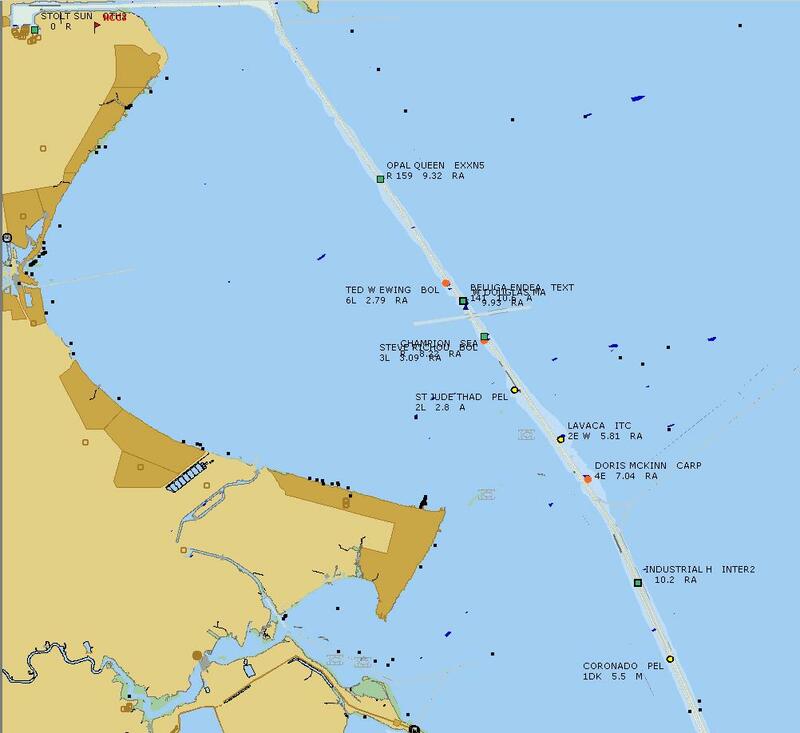 If transit requires entry into the Warning Zone, vessels are required to contact Coalition Maritime Security forces via marine VHF Channel 16, identify themselves, and make transit intentions known. If Coalition Maritime Security forces advise a vessel to depart the warning area, the vessel should immediately depart. Additionally, EXCLUSION ZONES are established and the right of innocent passage is temporarily suspended in accordance with international law around the KAAOT and ABOT oil terminals within Iraqi territorial waters. The exclusion zones extend 2,000 meters from the outer edges of the terminal structures in all directions. Only tankers and support vessels authorized by terminal operators or Coalition Maritime Security Forces are allowed to enter the exclusion zones. VESSELS ATTEMPTING TO ENTER THE ZONES WITHOUT AUTHORIZATION MAY BE SUBJECT TO DEFENSIVE MEASURES, including when necessary, the use of deadly force. All reasonable efforts will be taken to warn vessels before employing deadly force; however, deadly force will be employed when necessary to protect Coalition maritime security forces, legitimate shipping present in the exclusion zones, and the oil terminals. Fighting for the soul of Somalia? Warlords against Islamists. Reported here. It's not Predator v. Alien, but the consequences could be very important. Oil rose the most in a month in New York as Nigerian rebels threatened more attacks after cutting output from Africa's largest producer by about 20 percent. Royal Dutch Shell Plc closed 455,000 barrels a day of production after militants began a series of attacks on oil facilities and kidnapped nine foreign workers three days ago. The rebels blew up a pipeline yesterday. New York futures, which didn't trade on Monday, also rose because talks in Moscow failed to resolve the dispute over Iran's nuclear program. 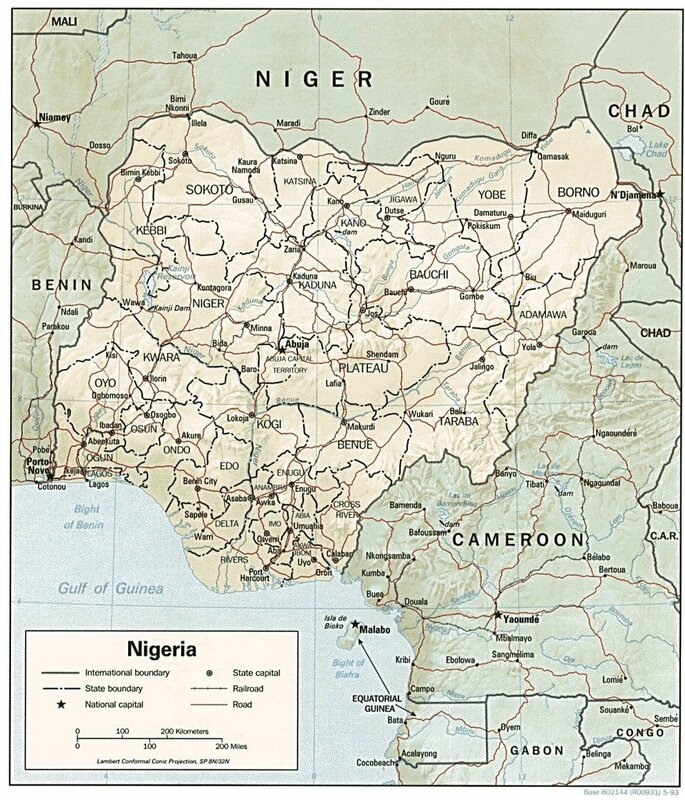 Earlier reports on "total war" of Nigerian rebelshere, here, and hereand at the links therein. And for Nigeria's place in the US import totals here. 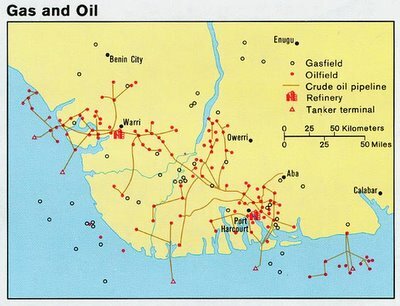 Map above is of oil and gas areas of Nigeria. UPDATE: Econbrowser takes note in Nigeria back in the news and says "And the news is not good." Amen. Nine Indonesians, mainly from the tsunami-hit province of Aceh, have been jailed for seven years for a pirate attack on a Malaysian-owned tanker, local media said Monday. The Sessions Court on Sunday sentenced the group for carrying out the armed, pre-dawn attack on the Nepline Delima off the northern resort island of Langkawi in the Malacca Strait last June. The tanker was carrying RM12 million (US$3.23 million) worth of diesel from Malaysia's Port Klang to Myanmar when it was boarded. The attack was foiled when a quick-thinking crewman from the tanker leapt into the pirates' boat and sped off to alert police. Original report on the attack here and a follow-on here. StrategyPage: Syrian ships for Iranian nukes? Syrian involvement in seaborne smuggling is one of the reasons it got tagged as part of the Axis of Evil. Get Syria out of the terrorism business, and you might get them out of the smuggling business as well. But that's unlikely. The Syrian government needs the money. 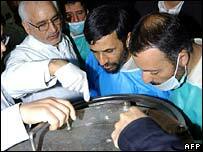 Iran was generous with its "foreign aid" because Syria provided support for terrorists Iran backed. Now Iran is keen on getting nuclear weapons. The first ones Iran will get will be large and delicate. The only feasible intercontinental delivery system will be a ship. A ship that is accustomed to moving illicit goods. Earlier reports of Iran experimenting with missiles on merchant ships here and here. Strategy Page names names of the suspect shipping companies. Reported here, negotiations for a "more modern" agreement between the Philippines and the US. He showed up in Antalya last summer with tens of thousands of dollars in cash and a face altered by plastic surgery. After his arrest, he told investigators he had planned to die steering a yacht laden with explosives into a cruise ship he believed was filled with U.S. soldiers and which was already approaching across the turquoise Mediterranean. ...In Antalya, Sakka spent lavishly preparing for the attack. Using an alias, he put down $60,000 on a villa in the Beldibi neighborhood, insisting on the unit closest to the beach, with a panoramic view of the resort city and its harbor. "His criterion was it had to be directly on the water, no matter what the price was," said Mehmet Yildirim, the watchman. The two-bedroom Apt. 1703 was closer to town, in a complex overlooking the marina where Sakka moored a 27-foot yacht, the Tufan. On board was diving equipment and a submersible water scooter, capable of running for 45 minutes at a depth of 75 feet. Karahan said Sakka spent days chatting with Israeli tourists, who flocked to the Turkish coast in summer, and learned the precise arrival time and route of the ship he planned to attack as it approached Antalya. In a rented Hyundai, he ferried the ingredients for a one-ton bomb -- hydrogen peroxide, aluminum powder, acetone -- from the port city of Mersin. Then he scoured Antalya's industrial zone for a shop that worked with chrome. Sakka needed someone to build a distiller, a glorified pressure cooker to concentrate the hydrogen. Last year, the Trans-Sahara Counter-Terrorism Initiative (TSCTI) was allocated just 16 million dollars -- pocket change compared to other U.S. military incursions across the globe. But funding for the exercises, described as enhancing regional security and stability, is expected to grow steadily in coming years. For 2006, the initiative has been allocated 31 million dollars. The big push comes in 2008, when the administration hopes to get 100 million each year for five years. To those keeping a close eye on the situation, the question arises whether there will be an accompanying U.S. military build-up in the region. "The answer is no," according to Maj. Holly Silkman, a public affairs officer for the U.S. military's European Command, or EUCOMM, which is based in Stuttgart, Germany. Besides Western and Central Europe, EUCOMM also claims West Africa as part of its defensive responsibility. "There are no plans for forward deployed forces in the region," which is U.S. military parlance for bases, Silkman told IPS. "There's not an African nation that wants us there." But Silkman does not downplay what many know: The U.S. military -- albeit in small numbers -- is on the move in Northwest Africa. Joint anti-terror training exercises, along with some humanitarian development projects, with forces from Chad, Nigeria, Mauritania and other countries are ongoing, she says. 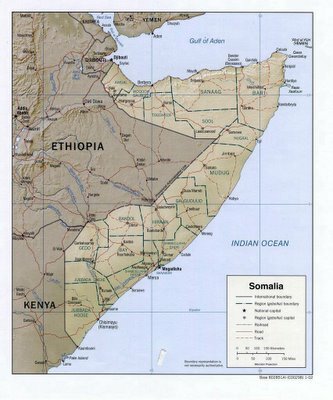 US Navy asked to act as Somali "fishery patrol"
The powerless Somali transitional government has asked the US Navy, which last month arrested pirates in the country's coastline, to extend its patrols in the Indian Ocean and curb illegal fishing along its vast coastline. The request came nearly a month after the US Navy's Fifth Fleet arrested 10 pirates who had attempted to hijack a merchant ship in Somali waters. "Somalia is grateful for recent initiative taken by the United States Navy aimed at curtailing rampant sea piracy that has been taking place in the territorial waters of Somalia," Fisheries and Marine Resources Minister Hassan Abshir Farah said in a statement Sunday. "But it will also be pleased if similar action could be taken against illegal fisheries in the Somali territorial waters. The illegal international fishing vessels cause serious damage to Somali marine resources and its environment," he said. Farah said curbing piracy and illegal fishing could be beneficial to the impoverished Horn of African nation of about 10 million people that has been wracked by lawlessness since 1991. "As Somalia's coastline is one of the busiest shipping lanes in the world, curbing sea piracy and illegal fishing will not only be beneficial to the Somali people but also to the international community," he added. The Somali government "is making every effort to address these serious problems of sea piracy and illegal fisheries in its coastal waters. Therefore, the government calls upon all the international community to join and support noble efforts being made by the United States," Farah said. The map to the left shows the natural resources of Somalia, and fishing is one of the "biggies." For many Somalis, especially marine experts and coastal dwellers, it all began when foreign fishing boats started invading the country's fishing grounds after the fall of the Somali government in the early 1990s. When the various rebel groups that had toppled the government failed to fill the vacuum and instead turned on each other, an opportunity arose for foreign vessels to invade the country's territorial waters and marine economic zone to fish for diverse species. "The trawlers began to come closer to the coast - looking for lucrative fish species - triggering direct confrontation between the foreign vessels and Somali inshore fishermen," Omar Abdulle Hayle, a Mogadishu based fishery expert says. "Criticism of the illegal fishing came from the South West Indian Ocean Fisheries Commission (SWIOFC), a United Nations body, but its words were not backed by deeds, ending up having no effect," Mr Hayle added. In recent months, fishing trawlers from Taiwan, China, Ukraine and other countries have been captured by Somali pirates, and released when ransoms have been paid. Since there is no government, it might be understandable if the Somalis are attempting, in the only way they have, to keep their waters free of foreign fishing craft. The argument is diluted, however, by the capture of non-fishing vessels and attacks on merchant shipping passing through the area (or up to 160 miles offshore). As to why the US ought to get involved, it seems, after several years of Somalia disintegration, that almost no one else gives a damn or has the capability of doing the job. I remain convinced that it job the UN, EU, NATO or some sort of African group ought to be handling since the sea lanes involved are not high priority to the US. 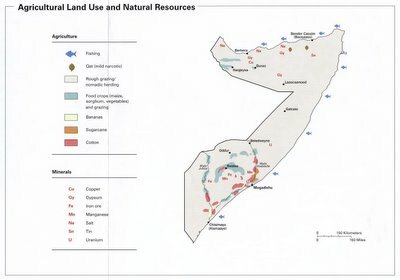 On the other hand, since Somalia is perhaps the prime example of a failed state that needs help to participate in the global economy (a one state example of Barnett's "gap") - it may behoove the US to become the prime mover in organizing (and even paying for) the effort to reconnect Somalia. Some of the same logic that Thomas Barnett is talking about here. Further, it cuts a leg off the argument of the pirates that they are filling in to do what their ineffective "government" cannot do and undercuts the support of the warlords who use the "protection" of the local fishermen as a means of earning and maintaining support. 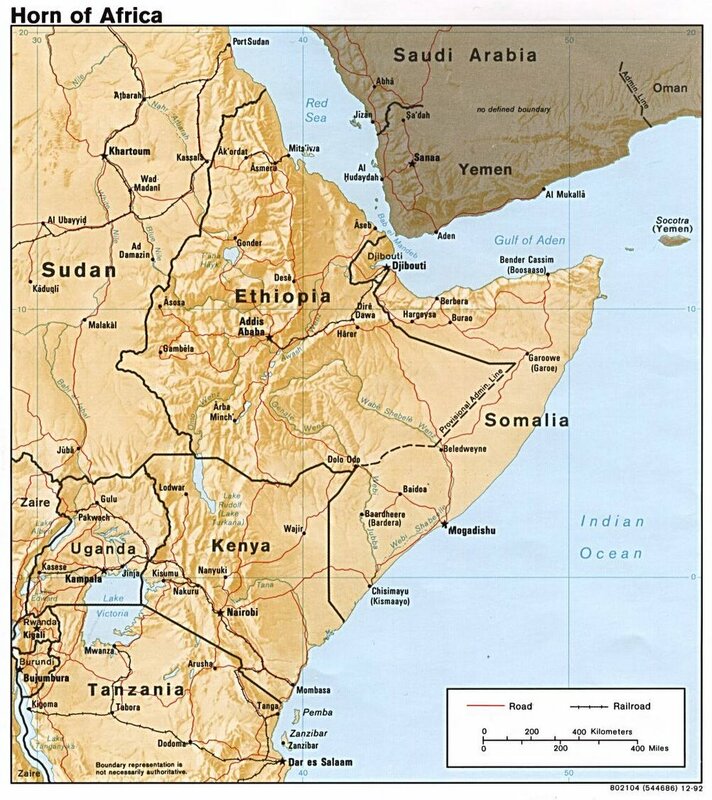 StrategyPage offers up a piece on the "pirate fishermen " of Somalia here. UPDATE: (2-20-06) A "breakaway" Somali province has taken matters into its own hands and arrested 84 Yemeni fishermen as reported here. The cause of the crash was unclear and there was no indication of hostile fire, said Maj. Susan Romano of the Combined Joint Task Force Horn of Africa, a U.S.-led military force headquartered at Camp Lemonier, a former base of the French Foreign Legion in Djibouti. 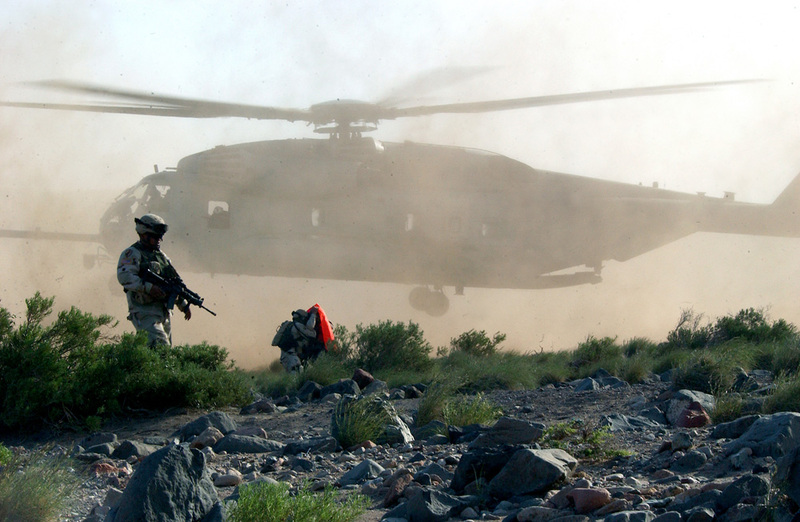 The CH-53E transport helicopters that went down Friday were carrying a dozen troops. 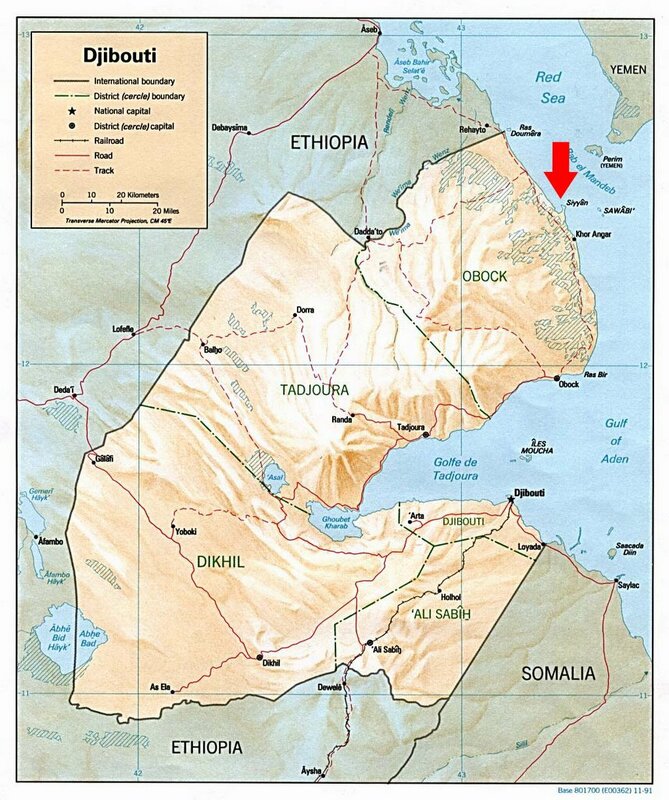 Two were rescued in the initial search not far from the coastal town of Ras Siyyan, in northern Djibouti. Our prayers are with the aircrews, troops and their families. UPDATE: (2/19/06) Ten dead, two rescued as reported here. Bless them all. Armed militants launched a wave of attacks across Nigeria's troubled Niger delta Saturday, blowing up oil and gas pipelines and seizing nine foreign oil workers in the latest violence to strike the troubled region. 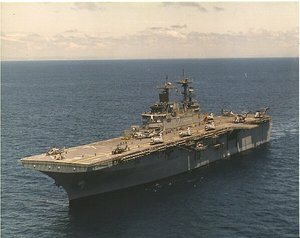 A Pentagon spokesman, Lt. Col. Brian Maka, said that in response to a Philippine government request, the U.S. military was dispatching the USS Essex and the USS Harper's Ferry, and possibly other ships. He said Army and Marine Corps ground forces that happened to be in the Philippines also were available to help. USS Essex on top, Harper's Ferry below. Info on disaster here. Deep Digger is different. It does not depend on the kinetic energy of the warhead at all – in fact, it parachutes down. Then it stars drilling. The weapon is limited only by how deep the drilling process can go, which is a matter of how deep it can ‘muck’ (clear debris from the shaft). And although the details are classified, that is much, much deeper than any kinetic weapon will ever go. In the tests last year, it demonstrated a tunneled down ten meters -- about 50% more than the BLU-113, which is the current record holder. It has numerous other advantages. One is a thinner casing which means more payload. Another is that it does not undergo a shattering 10,000g impact. Other penetrating bombs need special insensitive explosives; Deep Digger can carry a range of warheads, as well as sensors and communications. It can stay in touch with the launch aircraft and report its progress; multiple Deep Diggers could be co-ordinated to detonate simultaneously producing a combined shockwave. Part of the secret is the rock-breaking projectile, developed like the cannon at ARDEC, the US Army’s Armament Research Development and Engineering Center at Picatinny. 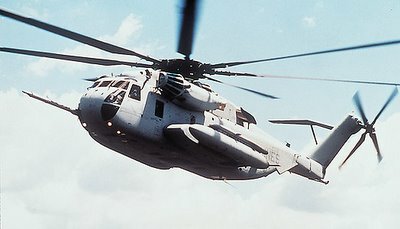 David Burns, the Program Manager, describes it as being a special .75 calibre round, a monolithic design which is more robust and performs better than earlier projectiles. In place of the blasting gel used earlier it now employs a solid high explosive called PAX-11, one of Picatinny’s own special recipes. And, yes, the North Koreans and the Iranians better be thinking about this new technology. The U.S. Navy currently maintains a force of approximately 550,000 full-time employees, about 35 percent of whom are civilians. At any given time, 130-plus of the Navy’s 283 ships are under way, about 45 percent of the total ship inventory. In 2004 the Chief of Naval Operations (CNO), then Admiral Vern Clark, directed the Navy to maximize capabilities, minimize payroll, improve productivity, and eliminate unnecessary billets. One way to meet those goals is to remove sailors from billets that have little to do with war fighting and replace them with civilians. At sea, for instance, sailors cut hair, serve meals, maintain the engineering plant, chip paint—all tasks that civilians are equally capable of performing, and in fact do perform at commands ashore. Placing civilians on warships to perform those functions is a logical extension of the CNO’s guidance and would free sailors for combat-related activities. Civilians who assist in operating and maintaining a warship engaged in international armed conflict might be viewed as having lost their protected status. There's a lot more, go read. A Navy officer testified in a Kenyan court Friday against 10 Somali men accused of piracy, saying U.S. sailors detained the suspects after firing warning shots that forced their vessel to stop. Lt. Lucas Michael Grant told the court that the sailors, who are part of an anti-terrorism task force based in Djibouti, detained the 10 Somalis on Jan. 22 in an operation involving U.S. military helicopters and a warship that fired several warning shots. 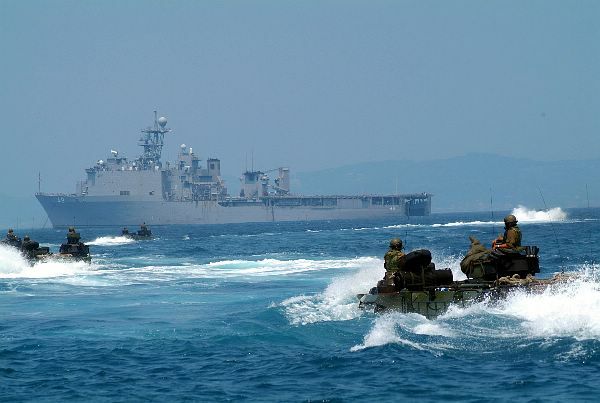 Grant said the U.S. troops, who were responding to a hijacking report from the International Maritime Bureau in Kuala Lumpur, tracked down an Indian-based vessel that the suspected pirates had taken over and were using to attack other ships. Nigerian militant commander in the oil-rich southern Niger Delta has told the BBC his group is declaring "total war" on all foreign oil interests. The group wants greater control of the oil wealth produced on their land. Nigeria is Africa's leading oil exporter and the fifth-biggest source of US oil imports, but despite its oil wealth, many Nigerians live in abject poverty. It is the first time the military leader of the Mend movement, Major-General Godswill Tamuno, has spoken publicly of his group's aims. He refused to be interviewed on tape or for his location to be disclosed. He told the BBC's Abdullahi Kaura Abubakar that they had launched their campaign, called "dark February", to ensure that all foreign oil interests left. See this for import figures from all countries to the US. The chained Farley Mowat floats under police guard in Cape Town harbor, out of reach of the whaling ships its captain seeks to destroy. 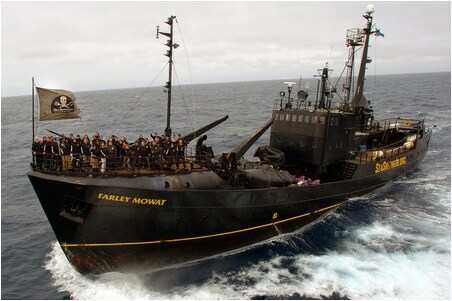 For seven weeks, the crew of the tiny activist ship harassed Japanese whalers in Antarctic waters, chasing the hunters through thousands of kilometers of icy seas. Now, the Canadian-registered ship has been forced to rest. Last month, it was detained on arrival in South Africa by marine officials who say it does not meet safety requirements. 08.02.2006 at 0450 UTC in position 15:21.7N - 052:34.1E, Gulf of Aden. Several high speedboats approached a RO RO ferry underway at forward and stern. Boats came within 400m at stern. Several persons in each boat had what appeared to be weapons. Master increased speed and after 10 mins boats sped off in a southerly direction. 07.02.2006 at 0120 LT in position 01:15N - 104:07E, Singapore straits. An unlit speedboat approached a chemical tanker underway at port bow. Master altered course and took evasive manoeuvres. However another speedboat with three persons came close to stern and tried to board. Crew took anti piracy measures and boarding was averted. It seems the boat at port bow was meant to create a diversion. France has for the first time explicitly accused Iran of using its nuclear programme as a cover for clandestine military nuclear activity. Foreign Minister Philippe Douste-Blazy told French TV no civilian programme could explain Iran's activity. Pirates of Strait of Malacca leading to sea lane control race? Nevertheless, the race to secure the straits has highlighted a potentially more destructive threat on Asia's sea- lanes as a result of growing competition for naval supremacy in the region. This inter-state naval posturing has been fueled by the importance of the waters for international trade, as well as the presence of a series of long- standing maritime territorial disputes and reports of oil and gas deposits in the disputed waters of the region. Furthermore, while these territorial disputes are over tangible resources, many of them are rooted in intangible issues of national identity. A federal agent working with port authorities in South Asia sounded the warning: A cargo container had tripped sensors that detect possible chemical, biological and nuclear weapons. The container was gliding west through the Mediterranean Sea on a ship bound for New York. Here, at the military's homeland defense headquarters in Colorado Springs, surveillance crews melded that tip with radar and satellite data. Surrounded by wall-sized screens, the high-tech trackers located the ship and followed it across the Atlantic Ocean. About 200 miles off the East Coast, Coast Guard forces intercepted and boarded the freighter and searched the cargo containers until they knew all of them were safe. Military officials wouldn't say more about this classified incident that occurred in November, but the way it was handled begins to reveal how secretive military forces in Colorado - the center for airspace surveillance through the Cold War - increasingly target the high seas to reduce what commanders see as a major vulnerability. Somali pirates are mean and they lie, too. Probably not a news flash, but Somali pirates beat Indian crew of ship. Security forces in central Somalia have apprehended a suspect in the hijacking of a humanitarian aid vessel at the town of Merka town four months ago. The man is alleged to be one of three people who hijacked a vessel chartered by the World Food Programme. I wonder if it's "torture" to allow this guy to starve to death, as his actions did to numerous Somalis who failed to receive their food aid because of him. Meanwhile, the trial of 10 alleged pirates arrested by the US navy has begun in the Kenyan port of Mombasa. The trial in Mombasa follows last week's ruling that the court can hear the case, even though the alleged offences took place on the high seas. The men have denied the charges and said they did not know why they had been "abducted" from their fishing boat. But Indian sailors taken hostage by pirates have identified the men. he U.S. Navy rescued a 3,000-tonne cargo ship attacked by pirates off the coast of lawless Somalia, the vessel's captain said late on Monday. In a spate of attacks along the unpatrolled waters off Somalia, gunmen stormed the United Arab Emirates-owned Al Manara last month, captain Deaa Naseh said. U.S. sailors arrested and left two suspected pirates locked up aboard the ship, Naseh said, adding that it was unclear what action would be taken against them. After the rescue mission, the ship suffered engine failure and drifted for 15 days before being towed at Naseh's request by the Seychelles coastguard into the port of Victoria on Saturday. "The attackers kept boarding and leaving the vessel at will going and coming back by smaller boats, but when the U.S. Navy personnel were about to board, the gunmen threw away their weapons into the sea," Naseh told Reuters. Looking tired and weak, he said he used makeshift sails to reach the Indian Ocean island. Someone let let the genius loose: Mr. Completely: Raytheon's Quick Kill System for RPG's. Way cool! 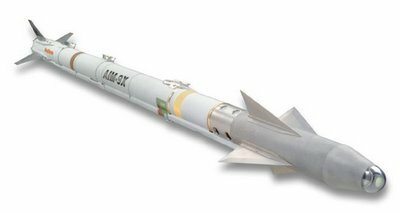 with an unprecedented offensive and defensive capability," said Brock McCaman, vice president of Raytheon Missile Systems Air-to-Air Product Line. "It's another example of the tactical flexibility of this proven weapon system." "This test is the first step toward an AIM-9X missile being launched vertically from a submarine," said John Cochran, the Raytheon IDS program manager. "Ultimately, the missile will be encased in a launch capsule. When the capsule broaches the surface, the missile will launch and then acquire and engage its target." More on the AIM-9X here and here. A new wrinkle in anti-air warfare for subs. Moving munitions at sea. Whoohah! The recently released Quadrennial Defense Review, which reveals long-term military planning, shows a top brass worried about the ideology of hate preached by imams across the Islamic world. 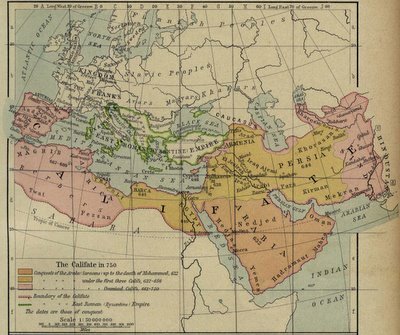 This ideology, though twisted, is somewhat coherent and calls for using terrorism to create a "caliphate," a unified Islamic state, stretching from Afghanistan and Iran all the way to Spain and including most of North Africa. For a lack of a better term, some American military planners call this ideology "bin Ladenism." Gen. Douglas Lute, director of operations for U.S. Central Command (which oversees U.S. forces in the Middle East), dropped by the offices of The Wall Street Journal recently. He noted that bin Ladenism has deep roots in many Islamic countries and that bin Laden isn't the only terrorist leader trying to appeal to populations oppressed by dictators. There are some 18 terrorist organizations that are part of what the military calls al Qaeda and Affiliated Movement. The military, he said, even has an acronym for it: AQAM. To counter bin Ladenism, the military is planning a two-stage war. The first is being fought in open battles in Afghanistan, Iraq and elsewhere and looks a lot like the kind of war most Americans assumed we'd wage on al Qaeda and terror-sponsoring states after the Sept. 11 attacks. The second stage is what senior military planners--including Mr. Rumsfeld--call "the Long War." It involves countering one set of ideas with another. If the Pentagon plans are to improve the lot of the masses and help them become part of the Thomas Barnett "functioning core", then full speed ahead, I say. It may be the only way to cut OBL's legs out from under him. UPDATE: Of course. this is not helping. It simply feeds the notion of the fanatics that they are being held down. Thanks, Crazy Uncle Al. UPDATE2: CDR Salamander is tracking down the same path, I think, here. The Iraqi navy consists of two squadrons — a patrol boat squadron and an assault boat squadron. It also includes one marine battalion, which serves both squadrons. 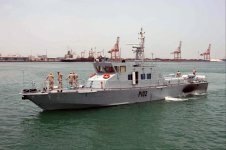 The patrol boat squadron uses Predator class patrol boats to conduct 24-hour security operations and sector patrols around the oil terminals and in Iraqi territorial waters. The assault boat squadron has 24 fast assault boats that routinely patrol the inland waters and approaches of the Kwar Abd Allah up to the port of Umm Qasr which is Iraq’s largest and only deep water port. According to Price, both have seen tactical successes in combating smuggling and piracy as well as conducting a couple of successful rescues at sea for injured mariners. “Incidents of piracy have continuously declined since the Iraqi Navy began 24/7 presence operations in the [Kwar Abd Allah] and their territorial waters,” Price said. “Last July, merchant ships were afraid to come into our port due to pirating, but that is no longer the case because our squadrons have been successfully patrolling the port,” Iraqi Navy Commodore Adel said. Info on the "Predator" patrol boats here. It is now official. Pirates, like terrorists, can run but they cannot hide. Not only along the coast of Somalia, which is currently the world's most dangerous waters for pirate activities, but also along areas in Southeast Asia such as the Straits of Malacca that are traditional havens for pirates. The United States does not anymore see the difference between pirates and terrorists, and with good reason. A study carried out by the Piracy Reporting Centre says that freighters carrying payloads of fuel could be hijacked and used in terror operations similar to the 11 September attacks on America. There is real fear that terrorists could, for example, use a ship transporting liquefied natural gas as a weapon. In any case, action by the US Navy will benefit Kenya because of the dangers posed by pirates to the country's tourism and maritime trade. The shores off the East African coast are important sea-lanes for cargo ships and luxury cruise liners. And many of the cargo ships are oil supertankers and attacks on them could trigger environmental disasters through crude oil spillage. The modus operandi of the pirates makes such possibilities real. Pirates in Somali waters attack with heavy firearms everything that floats, from fishing vessels and yachts to bulk carriers, general cargo ships and tankers. Their aim is to steal valuables from the ship, or hold the crew for ransom. IMB says it has received reports of Somali pirates armed with automatic weapons and rocket propelled grenades, firing indiscriminately in attempts to force such vessels to stop. "The lack of any stable or coherent government in Somalia is contributing to this lawlessness in its waters. Local warlords are interested in making money above all else, and hijacking commercial vessels has proven to be an expedient method of doing so," notes Captain Pottengal Mukundan, director of IMB. The good news is that all pirates are international outlaws triable by any and every state. Any state may seize a pirate ship or aircraft, arrest the persons, seize the property on board and try the persons or hand them over to another state. Not only Kenya benefits, but so do those other African states dependent on the port of Mombassa (see here). Examine this chart provided by the fine folks at Chart of the Day (chartoftheday.com). 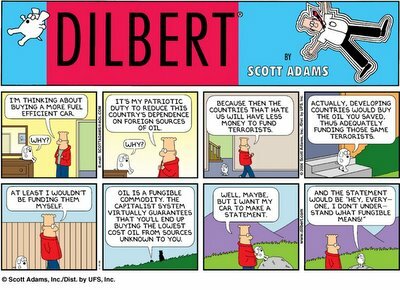 Certainly, the US uses lots of oil. Throwing in Germany (population 82,431,390) without including the rest of Europe is a little odd. For comparison, Japan has 120.000.000 people, the US over 300,000,000 and China has 1.3 billion. Europe has a population of around 710,000,000 (EU alone is 456,953,258). 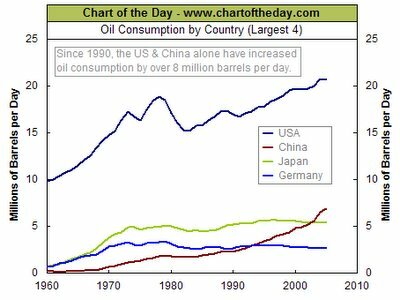 UPDATE: Found a chart of oil consumption per capita here. US is 17th (behind 16 small, mostly island places) with .677 barrels per day. Canada is 19th at .668. Germany is 53rd at .325. The industrialized countries are the largest consumers of oil but until 1998 had not been the most important growth markets for some years. The countries of the Organization for Economic Cooperation and Development (OECD), for instance, account for almost 2/3 of worldwide daily oil consumption. 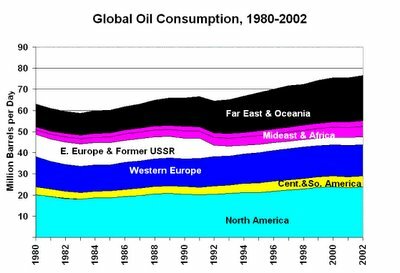 In contrast, however, oil demand in the OECD grew by some 11 percent over the 1991-97 period, while demand outside the OECD (excluding the Former Soviet Union) grew by 35 percent. The Former Soviet Union presents a special case. The collapse of the Russian economy that accompanied the collapse of Communism led to a decline in oil consumption of more than 50 percent over the 1991-98 period. 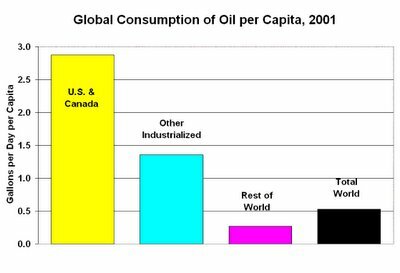 The developed economies use oil much more intensively than the developing economies, and Canada and the United States stand almost alone in their consumption of oil per capita (see graph). 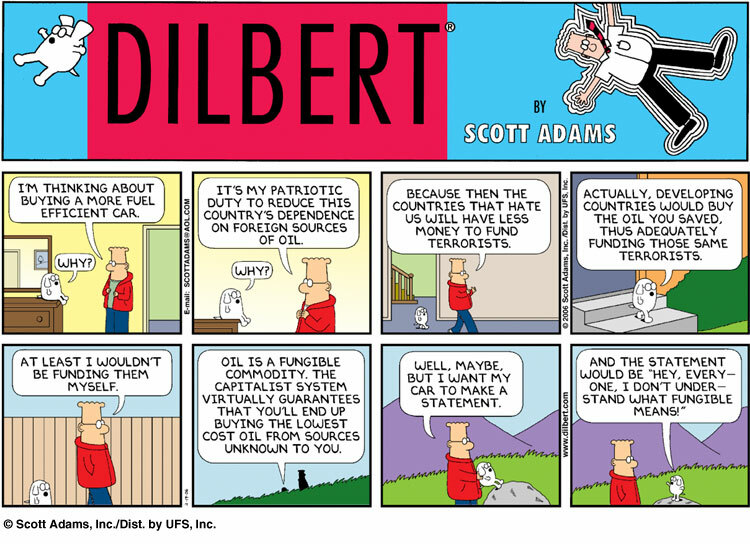 For instance, oil consumption in the United States and Canada equals almost 3 gallons per day per capita. (The difference is these countries' transportation sectors, with their dependence on private vehicles to travel relatively long distances.) Oil consumption in the rest of the OECD equals 1.4 gallons per day per capita. Outside of the OECD, oil consumption equals 0.2 gallons per day per capita. Regionally, the largest consuming area remains North America (dominated by the United States), followed by Asia (with Japan the largest consumer), Europe (where consumption is more evenly spread among the nations), and then the other regions. As the regional graphs illustrate, Asia was the region with the fastest demand growth until the 1998 economic crisis in East Asia. The region's economic upheaval is a central reason for the oil price collapse of 1998. The United States and Canada use oil more for transportation than for heat and power, but the opposite pattern holds for most of the rest of the world: most regions use more oil for heat and power than for transportation. As a result, global demand for oil is highest in the Northern Hemisphere's cold months. There is a swing of 3-4 million barrels per day (some 5 percent) between the 4th quarter of the year, when demand is highest, to the 3rd quarter, when it is lowest. (The precise amount varies from year-to-year, depending on weather, economic activity and other factors.) While the 4th quarter is not the coldest in any region, estimated demand calculations are swollen by the traditional stock building that occurs during the period. Game theory and terrorist targets? Somali pirate suspects plead "innocent"
Another offshore LNG project for California?